Mumbai: American brands top the domestic retail space with 30 per cent share, especially in the food & beverages sapce, while the Italian and British labels dominate the luxury segment, says an industry report. "An analysis of top 300 global retail brands by their country-of-origin reveals that American brands account for the bulk of global retailers present in the country," industry research firm CBRE South Asia chairman Anshuman Magazine said. CBRE recently studied over 300 prominent global retailer brands to identify operating trends, expansion strategies, and extent of penetration across leading cities. Comprising nearly 30 per cent of total brands analysed for the study, most American retailers are present in the mass market food and beverage (F&B) category in the country, he said. On the other hand, retailers from Italy and Britain, account for about 19 and 16 per cent respectively of the total share of global brands analysed and are largely into luxury segment, with brands such as Hermes, Chanel and Fendi, Magazine said. A segment-wise focus on the brands originally from the US, Italy and Britain revealed that most belonged to the fashion and apparel, and F&B segments. While most brands originating in the US and Britain have a wider presence in the fashion and apparel segment, in the luxury space, around 60 per cent are Italian brands, the report said. 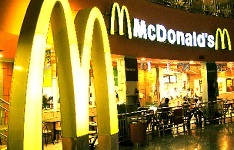 American brands have a dominant positioning the F&B category with brands such as McDonald's, KFC and Subway. Additionally, Spanish retailers, particularly Mango and Zara, have made a major impact on fashion trends since their entry into the country and have been steadily expanding their retail footprint across smaller cities, added the report.